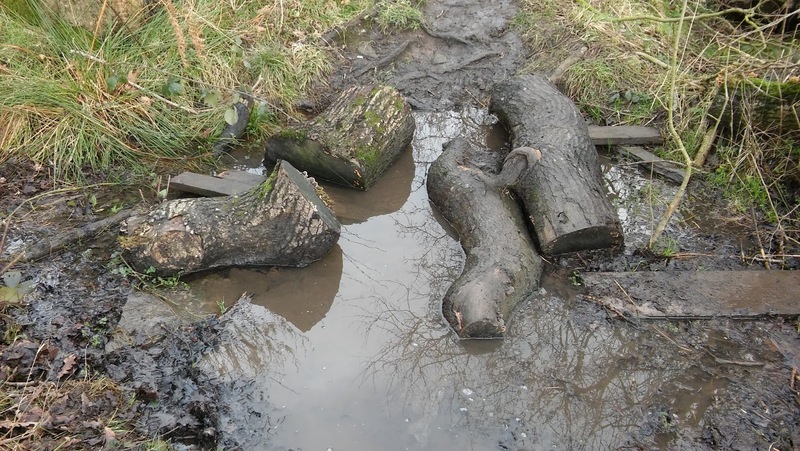 It's been a zooming kind of week here in Winwick. 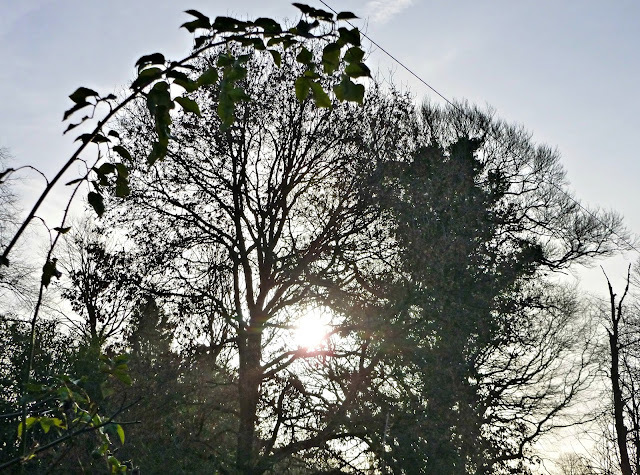 The month is zooming by - it's going to be February in a few days and already the mornings are getting lighter and the days slightly longer. Even the days of the week are zooming - how can it be Thursday already?! - and we're heading speedily towards the weekend. You'll be pleased to know that I have also been zooming during this week. The dog and I have zoomed on our walks, dodging rain showers and big puddles - or at least, I have been dodging the puddles. 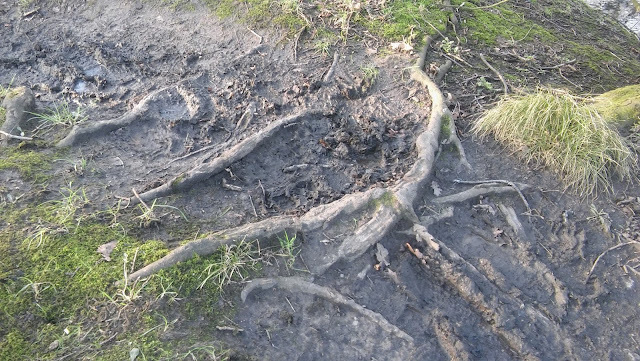 I've been watching my step very carefully as the paths are very muddy and the exposed tree roots are extremely slippy. I've been wishing for four-paw drive myself! These logs across the flooded path make me think of crocodiles, or perhaps seals! I hadn't realised just how lovely the light was today until I came to look at these pictures later. 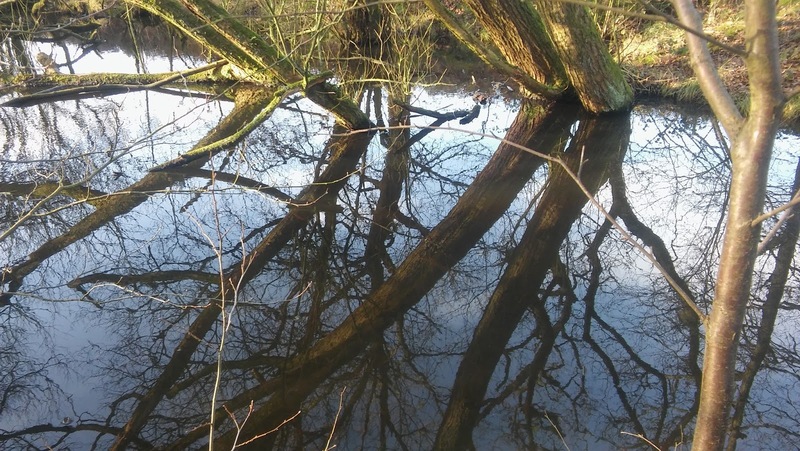 I was so taken by the reflections in the water, the pools were much deeper than usual and they were so very still. 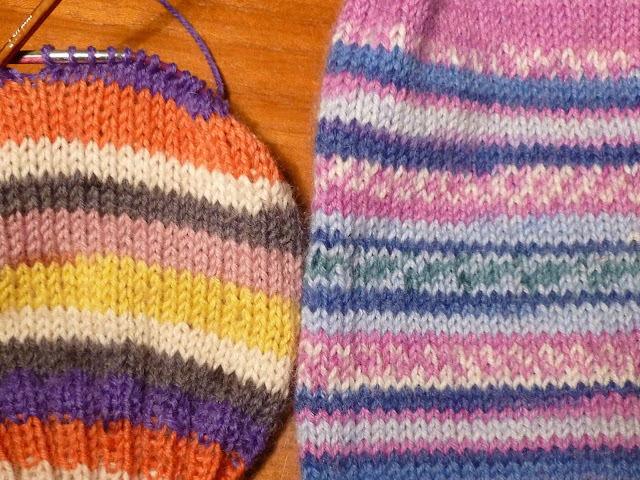 Another pair of Split Mittens has zoomed off my needles and are finished. 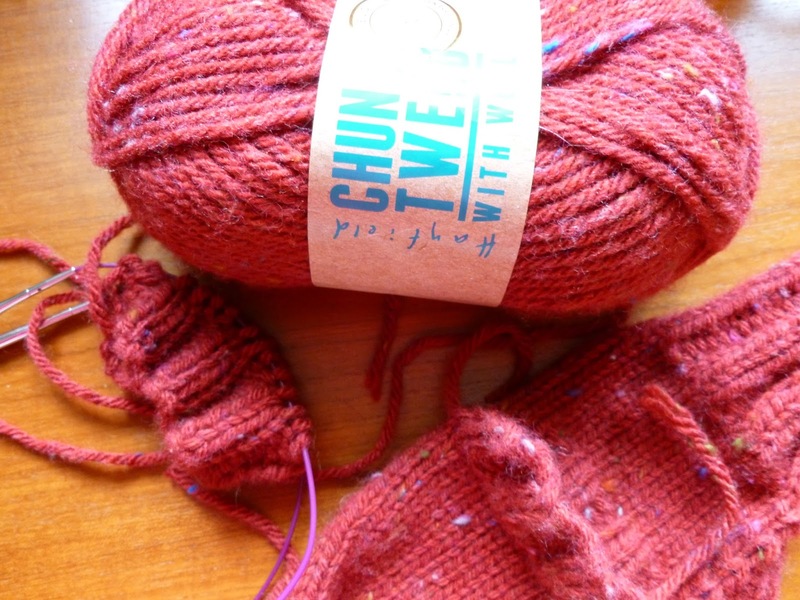 These ones are in Hayfield chunky tweed yarn and I do like the little flecks of colour very much. 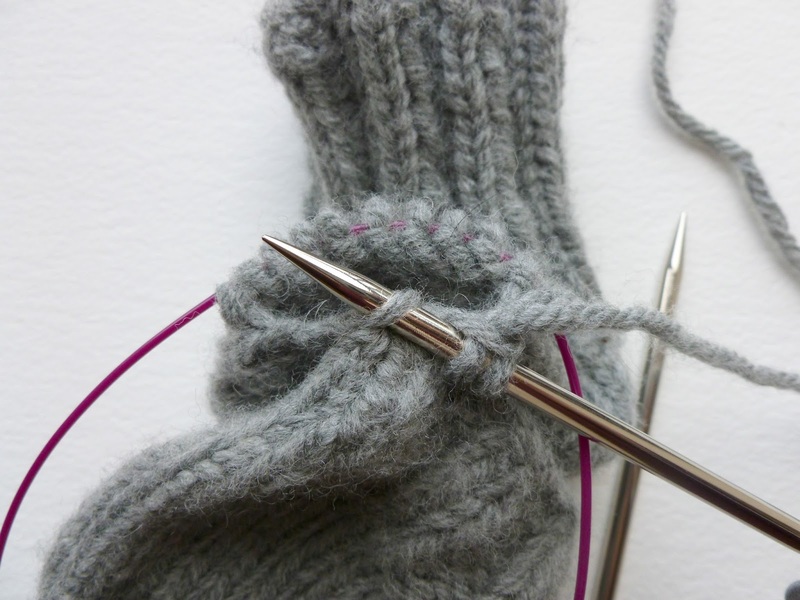 These mittens are so easy to make and so useful, I really love them! 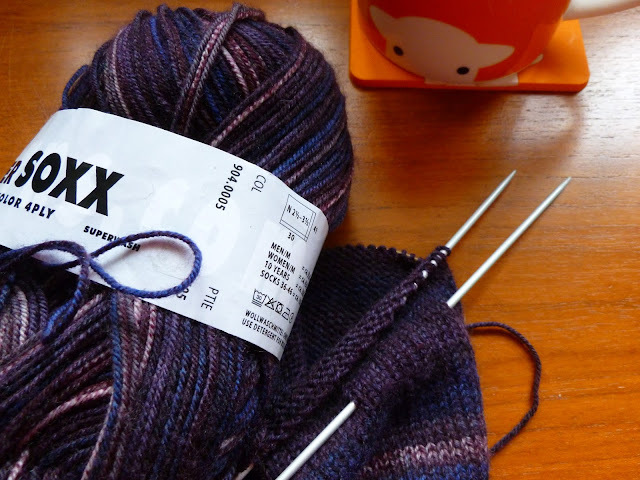 I started a three week series of workshops at Black Sheep Wools this week, based on the original three week Sockalong on the blog last May. 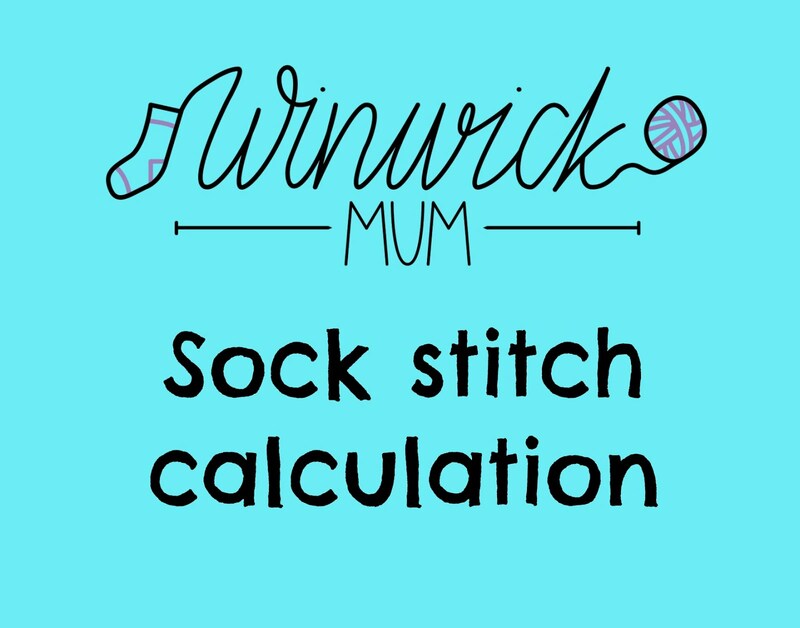 It was great fun to meet people in real life who are going to knit the socks, and all of the ladies who came along have promised to come back next week so I can't have scared them too much! 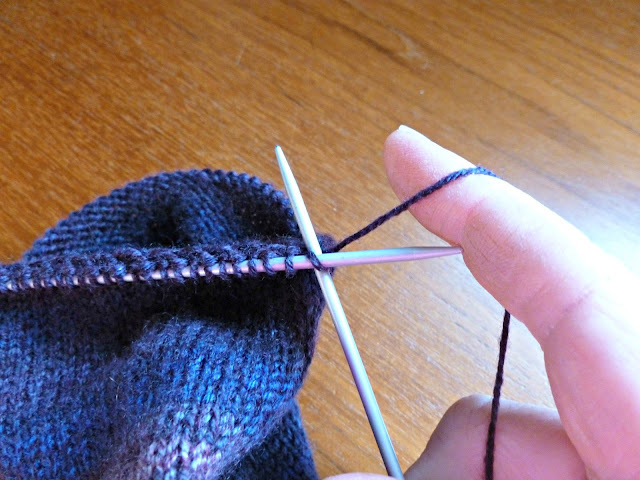 I'm also knitting the socks in real time as the classes go along so that we're all working on them together. 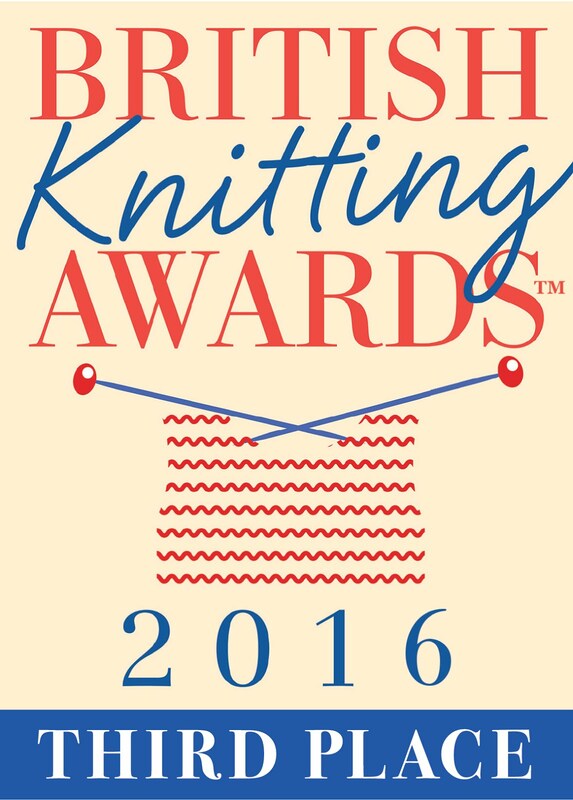 I've decided to use mine as an opportunity to practice my Continental knitting technique as I've had enough of my small sample. I'm not doing too badly at all - knitting the small section that I did has helped enormously and I've found a way of wrapping the yarn around my fingers which helps the tension to be a bit more even. What do you think? It's not as good as my usual tension yet and I know it will take quite a bit more practice, but it's certainly an improvement on my first attempts. I wouldn't say that I'm really zooming with this yet though. I'm still quite a bit slower than I am with my "flick" style, but I have to keep reminding myself that I'm still learning. I've taken to timing myself with my phone to see if I am actually getting any faster (I'm not impatient at all!) and slowly but surely I definitely am. 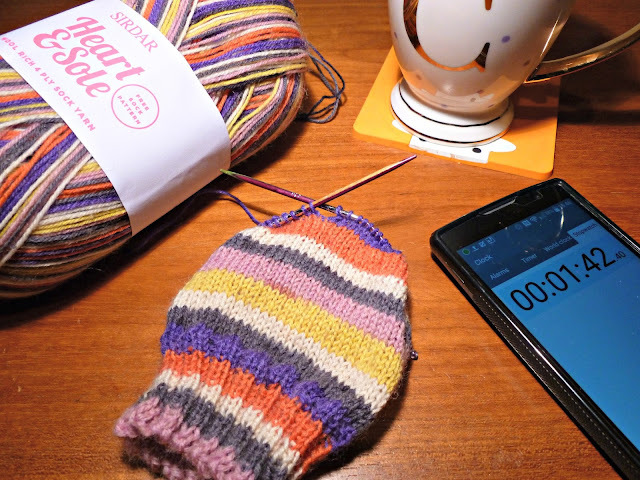 By the time I reach the end of this pair of socks, I hope to have cracked the tension and the speed or at least have had a really good go at it! So am I taking care of myself in amongst all of this zooming? Actually, I am doing my best to. I am making sure that I drink plenty during the day, that I sit down to eat my lunch (ad actually have lunch at all) and that I turn the computer off at a sensible time at night. I've managed to take my own advice for nearly a month, and some would say (my husband certainly would!) that that's a first. How are you doing this month? 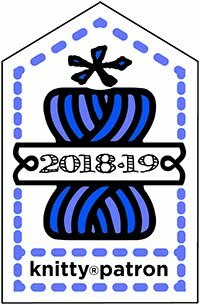 I don't tend to suffer from January blues but I know lots of others do. I hope you are taking care of yourselves! 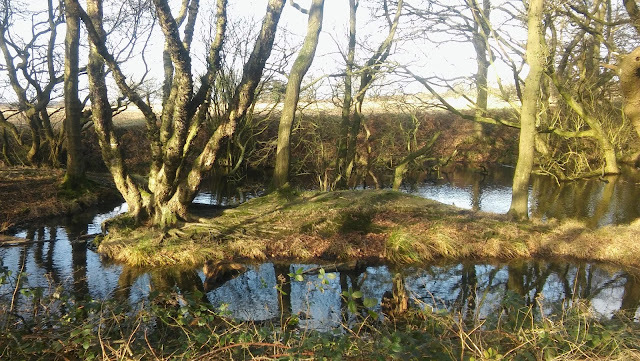 Don't forget that I'm going to be at The Makery by Unique Seal at 12 Ormskirk Road in Rainford on Saturday 30 January from 11am till 1pm if you can drop by and say hello! 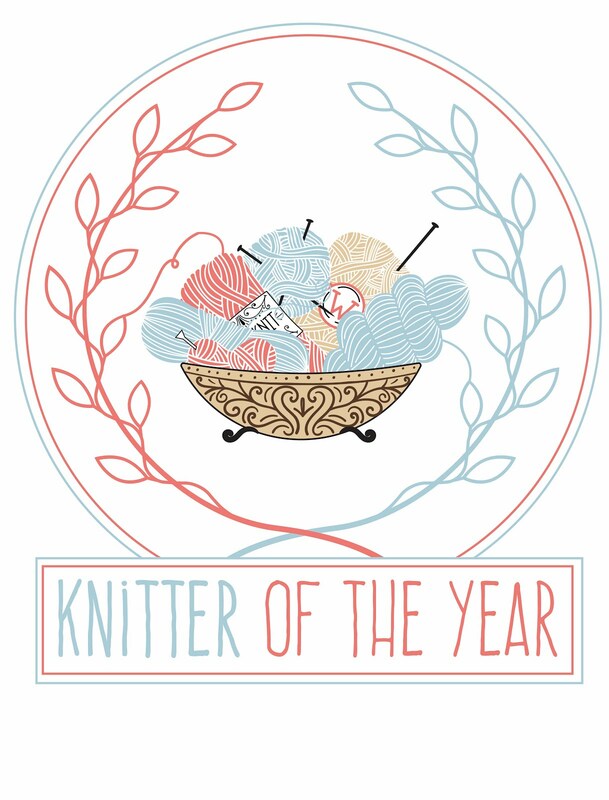 Sometimes, I think that all of the yarns and patterns that are available are the knitter's equivalent of a sweetie shop - the only good thing is that the don't make your teeth fall out! I've been feeling little guilty this week as I've cast on another two projects before I've finished some other things that I'm working on - although to be fair, the ones that I showed you in this post back in October are now done except for the summer top and the sock yarn blanket which is a long-term project, so it's not as if I have endless WIPs (works in progress). 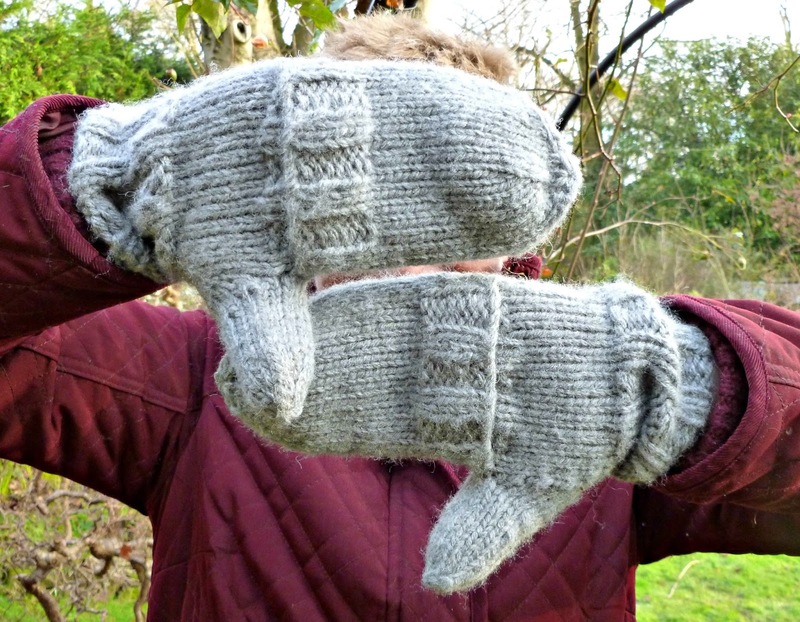 Before I show you what I'm up to, I must say thank you for all the lovely comments about my Split Mittens pattern. I'm hoping there are going to be lots of much warmer hands around! 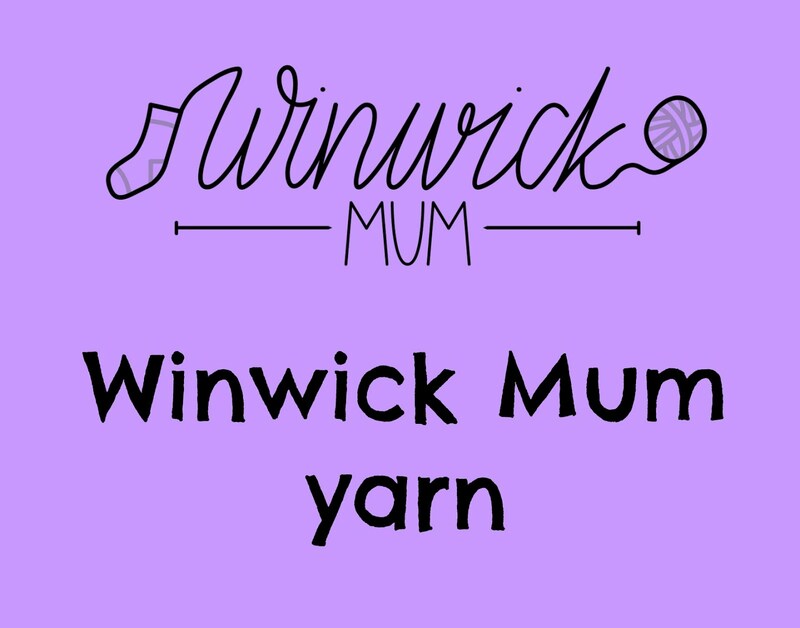 I've seen one or two pairs in progress already and I'm really looking forward to seeing them in lots of colours and different types of yarns. I've reached the heel of my second cashmere sock - I'm really looking forward to putting these on my feet as they feel absolutely gorgeous whilst I'm knitting them. Too nice to wear, perhaps - although I have made a resolution that I am going to knit the lovely yarns that I have in my stash, not just "keep them for best" or endlessly squish them. Sometimes it takes a while to find the perfect pattern, but I am determined not to leave the yarns unknitted. I think this is something that's clicked in my mind whilst we've been clearing out my Dad's house - there is so much stuff that he has kept because it may come in useful one day, and we look at it and say, "I don't know what to do with that". I don't want that to happen with my yarns, and it probably would as at the moment, neither of my girls are obsessively into knitting like me. 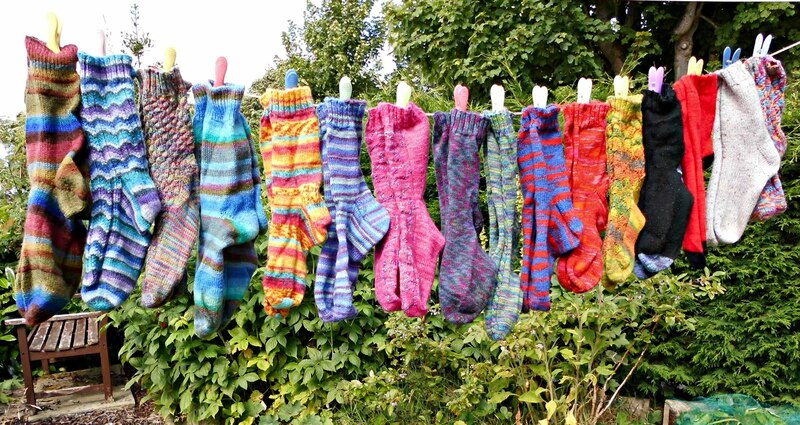 That seems like a waste, and I don't like waste - and especially not waste of my sock yarn! This is one of those yarns that I have no intention of wasting. It's Regia Design Line Arne & Carlos (shade 03653, Star Night colour) and I've been itching to cast it on ever since I bought it, but have made myself wait until I had finished other things first. As you can see, I got fed up of waiting! It's cast on and is also up to the heel but on the first sock so I've still got a way to go before I can get these on my tootsies, but I'm really loving the colours and the way it knits up into the Fair Isle patterns. 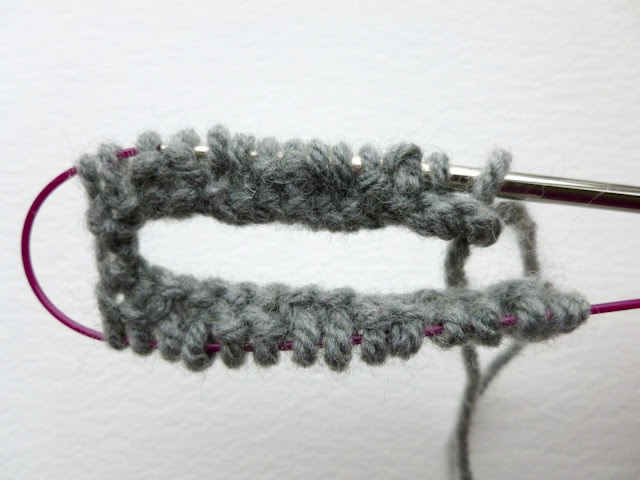 I think it's so clever how the yarn just does that without any help from me! I've got a few patterned pairs lined up next, but I wanted this pair to be plain so that I could see the colours without them being broken up in any way. 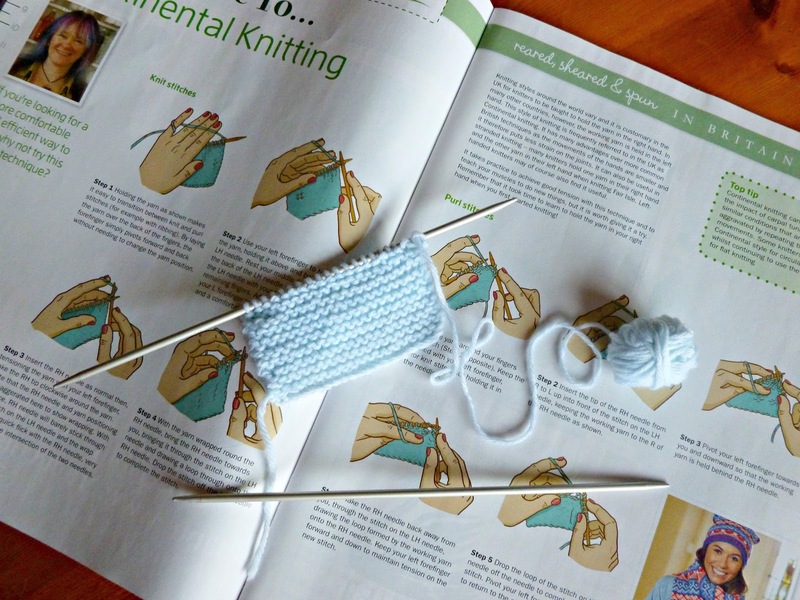 In the midst of this, I have been trying (again) to teach myself how to do Continental knitting. 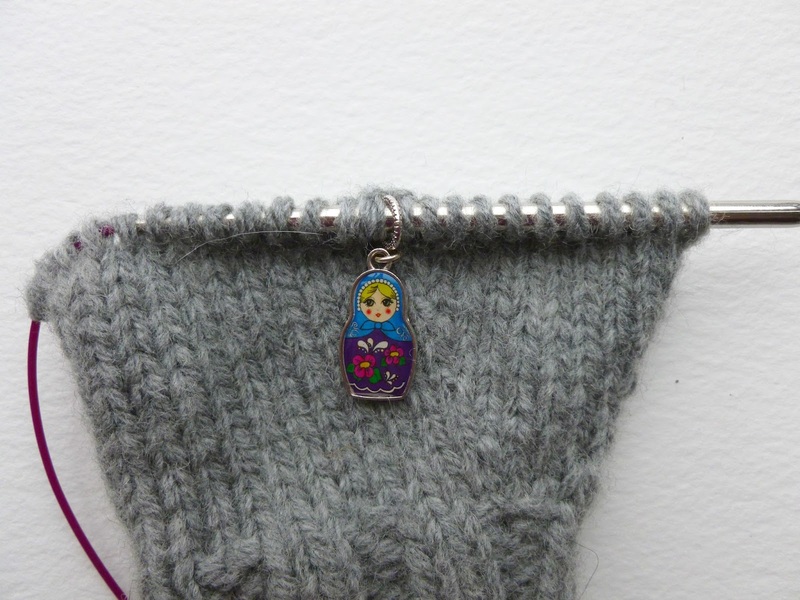 Depending on how you pick up your yarn and in particular create your purl stitch, this is also seems to be variously known as German knitting, Norwegian knitting, Russian knitting and East European knitting, but the point of it is that it's meant to be super-fast once you get going. 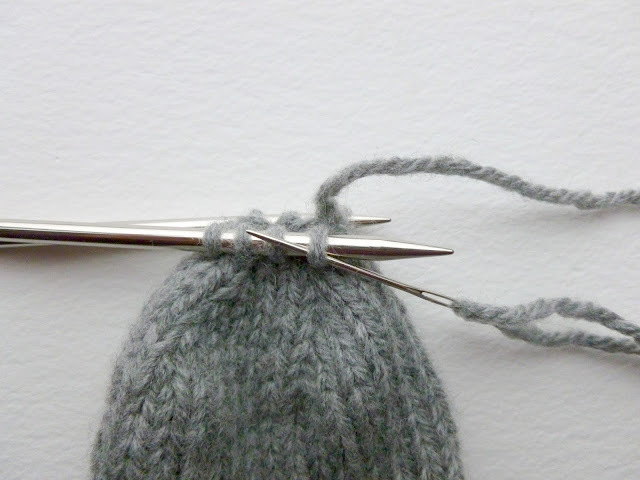 My knitting technique is what's known as English knitting, although I'm a "flicker" rather than a "thrower" which means that I don't let go of my knitting to wind the yarn around the needle but instead flick it over. 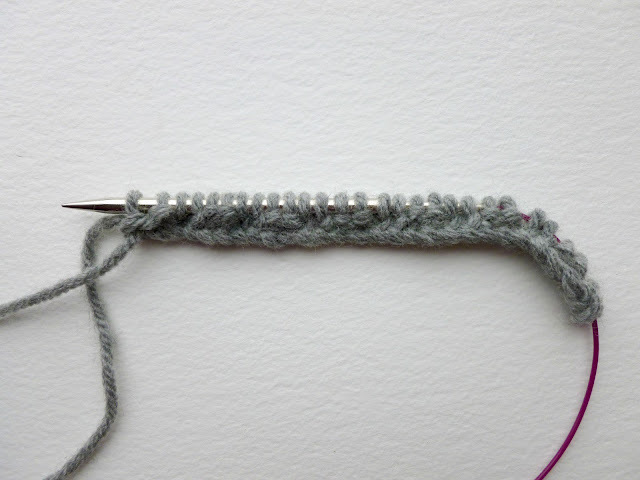 It's pretty quick as I've been doing it for a long time so the muscle memory is very strong, but I'm still in awe of the knitting speed of people who use the other methods. In addition, you can do stranded knitting with yarns in both hands rather than having to pick up and put down the yarns each time. 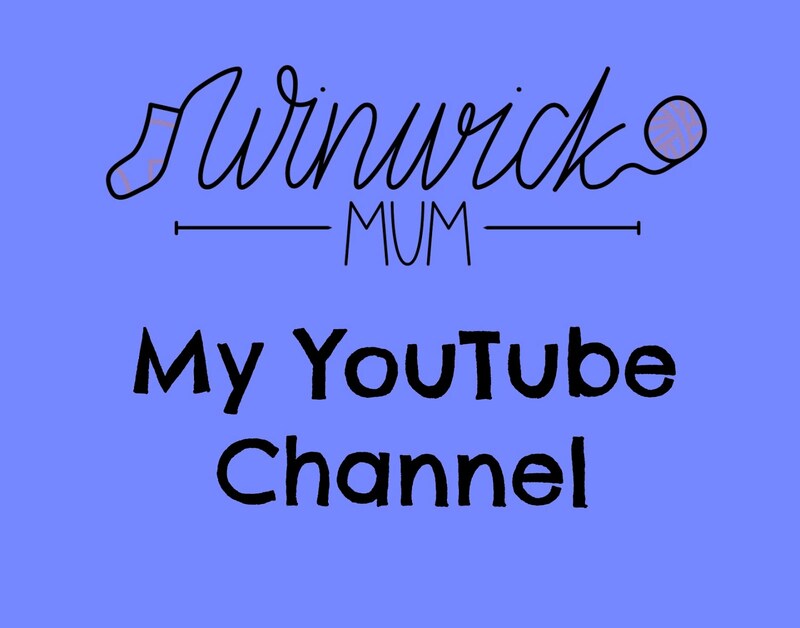 It's time that I got to grips with this technique! to my left hand. Piece of cake - or so you'd think. I started off by thinking that I would just knit a pair of socks using this way of knitting and by the time I'd finished I'd be an expert, but forgot that by doing something different I was actually back to being a new knitter. I couldn't get my tension right and it seemed frustratingly slow. 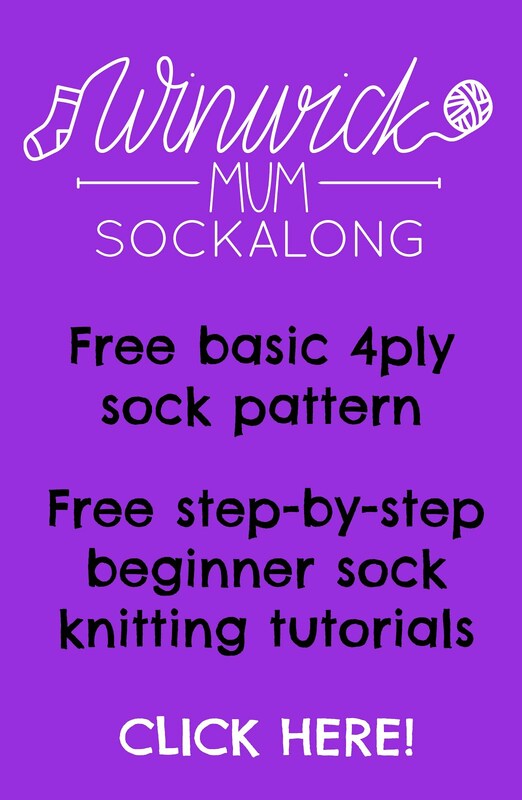 I decided to go back to basics and practise right away from my socks until I felt I had enough control over what I was doing to attempt them again. 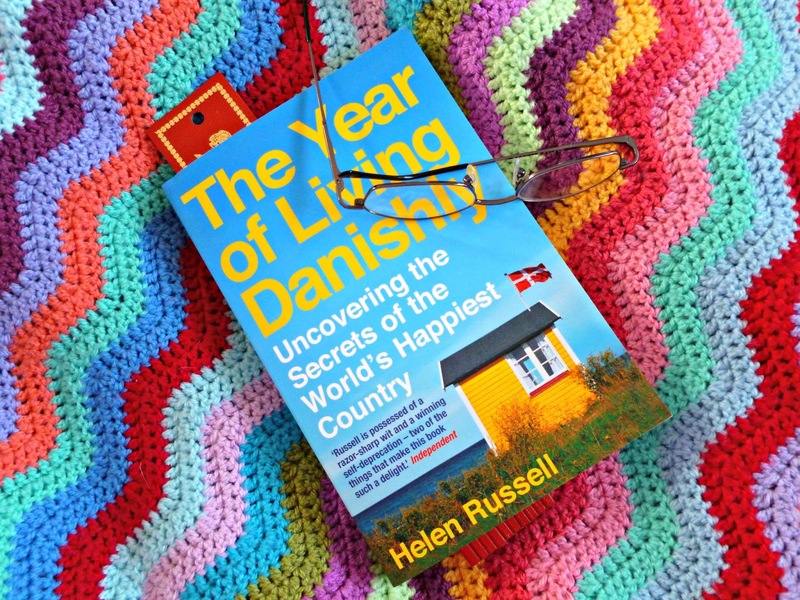 I found this article in December's KnitNow magazine, and I've also been watching YouTube videos such as this one by Arne and Carlos (for them it's called Norwegian knitting) and this one where the yarn is wrapped differently around the knitter's fingers. I guess in the end you have to find your own way to get your tension right and there's no short cut for just getting in there and practising! I also said that this year I was going to make more of an effort to take care of myself so I've been making an effort to turn my face to the sunshine whenever it's peeped out of the clouds and enjoying a few moments of sunlit warmth on my skin. I think the dog has wondered what I'm doing a few times when I've suddenly stopped walking, but I tell him that I'm being mindful and he has to wait. He's not always good at waiting so sometimes my mindful moments are cut short, but the thought is there! 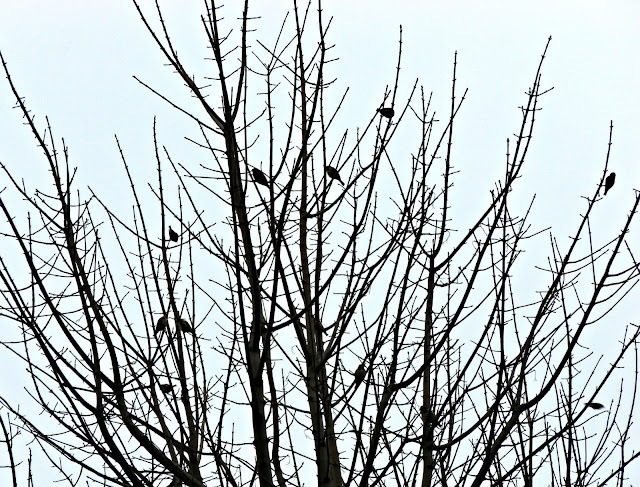 I had to come out of the house the other day to see what was going on in the garden - there was a host of sparrows in the tree all busily shouting to each other and being generally very noisy. I renamed them a 'racket of sparrows' instead! I've been making a real effort to switch off at night before I go to bed - quite literally as the computer is turned off so that I'm not tempted to surf just before I go to sleep - and I've been reading instead. This is the next book in the pile that I have to read and after I'd enjoyed the Astronaut's Guide ... , I was looking forward to starting this one. I've not been disappointed. In fact, it's been making me laugh out loud and I've been doing that really annoying thing that I always get cross about when my husband does it, namely exclaiming "listen to this bit!" and then proceeding to read it out. "You'll have to read this book after me," he tells me when he's reading a book he's enjoying, and I point out that I won't need to because I've already heard all the best bits. I don't think my husband will need to read this book either. 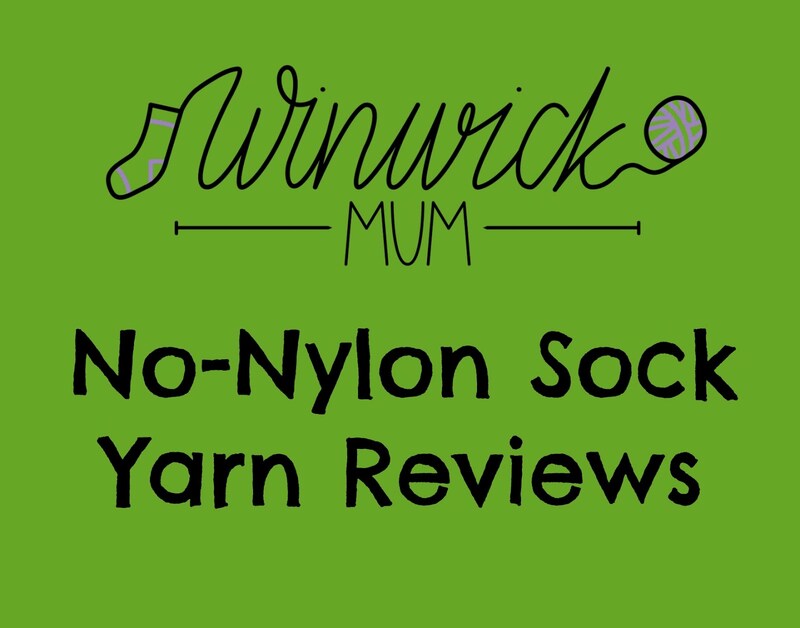 Finally, if you're at a loose end next Saturday (30 January) and over in my part of the world (north west England), then I'm going to be at The Makery by Unique Seal at 12 Ormskirk Road in Rainford, near St Helens for a drop in knit n natter and sock clinic. 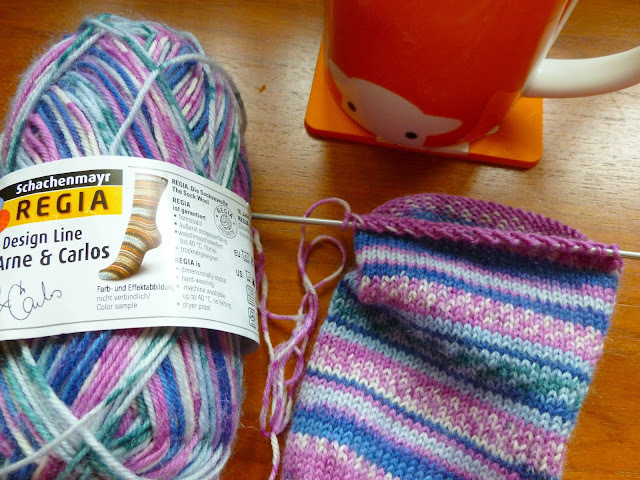 You don't have to be knitting socks to come along, as Catherine has all kinds of other crafts to see at her shop. 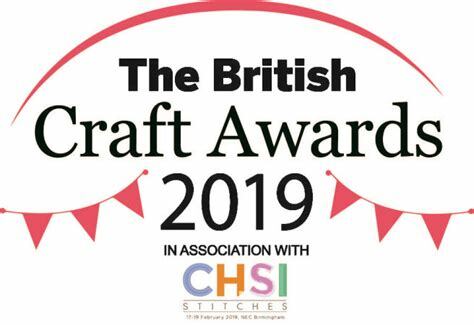 I'm going to be at The Makery from 11am until 1pm so do drop in and say hello if you can! Catherine is asking people to let her know if you're coming so that she can make sure there are enough chairs. You can either contact her through her Facebook page or on 01744 884567. There is a small charge of £2 per person. I hope you're enjoying your weekend, and if you're caught up in the snow in the US, do stay safe and warm. 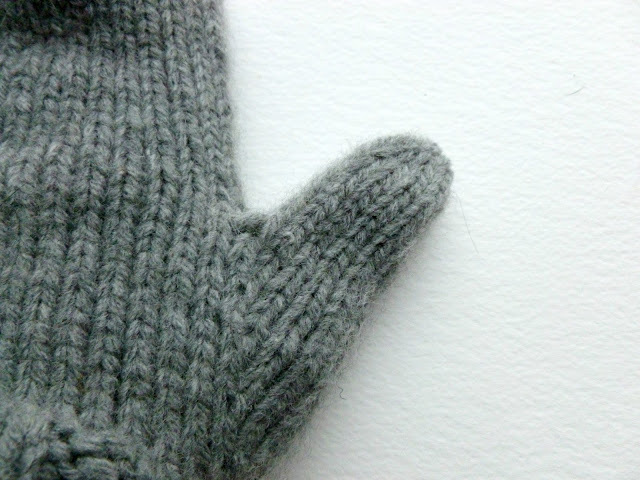 As I've got older, I've realised that I'm much more of a mitten than a glove kind of person. I don't deny that gloves are practical and useful and I have more than a few pairs myself, but there's just something about a mitten that I really like. My hands are warmer, for a start, as my fingers are all together and as I'm out with the dog in all weathers at this time of year, I need warm hands to be able to deal with lead buckles and my pocketful of treats which keep the dog from abandoning me altogether in favour of more exciting smells. However, there is an inherent problem with mittens in that you can only deal with said lead buckles and treats - and anything else you might want to hold, from cameras to car keys - if you take your mittens off. I got tired of whipping them off to pull them back on over frozen fingers which had only just warmed up by the time I had to take them off again. 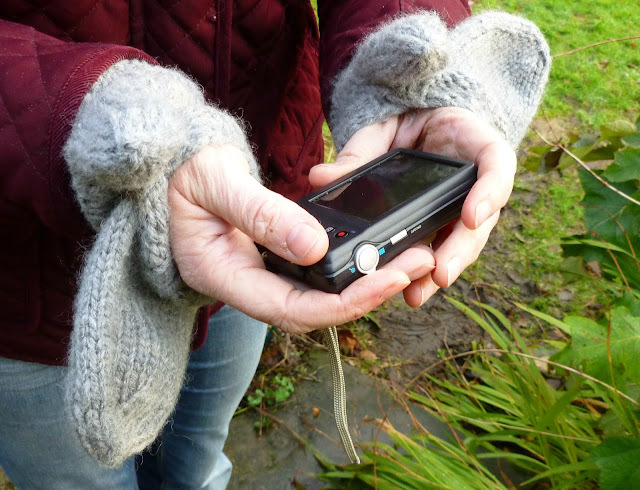 I've never seen the point in fingerless gloves, and those ones where you have a little flap to pull over the top just look too fiddly when it's freezing cold and you're trying to scoop unmentionables into a poop bag as tidily as you can. There has to be a solution, I said to myself. And this is it! The Split Mitten. 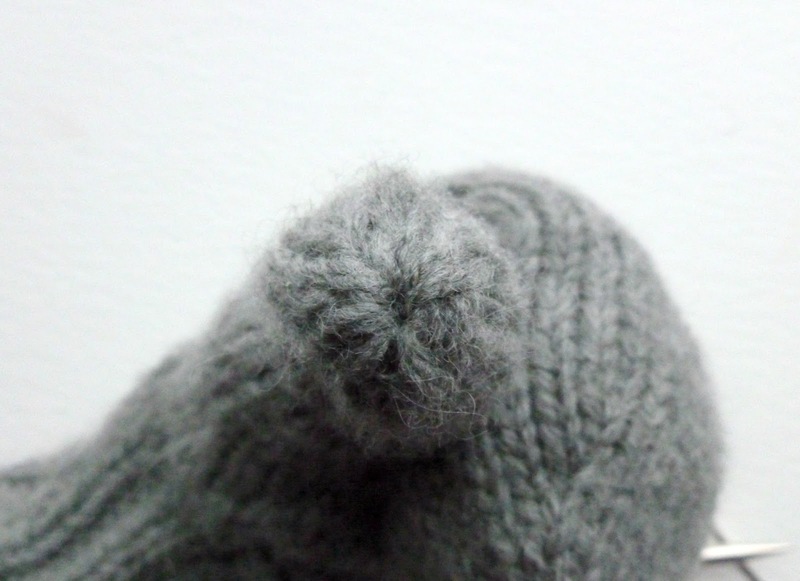 A mitten with a flap in the middle of your hand so that it's easy to pop your whole hand out, take your photos, pick up the poop or do whatever you need to do, and then slip it back inside where it's still warm because your mitten never actually leaves your hand. The long cuff makes sure that the mitten stays put inside your coat sleeves too. I'm not a girl who likes unexpected draughts. But don't your hands get cold with that flap? I hear you ask. Surprisingly, no. 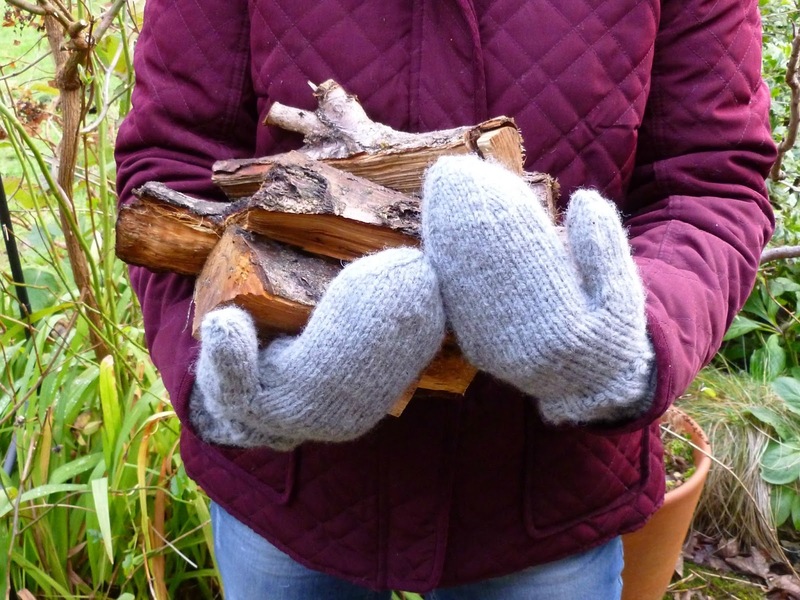 I've been wearing a prototype of these mittens for about three winters now (I hope you're impressed with my dedication to mitten research and development!) and I've not had a problem with draughty palms. Because of the way the flap is made, it allows your hand out but then keeps your hand warm again once it's back inside the mitten. 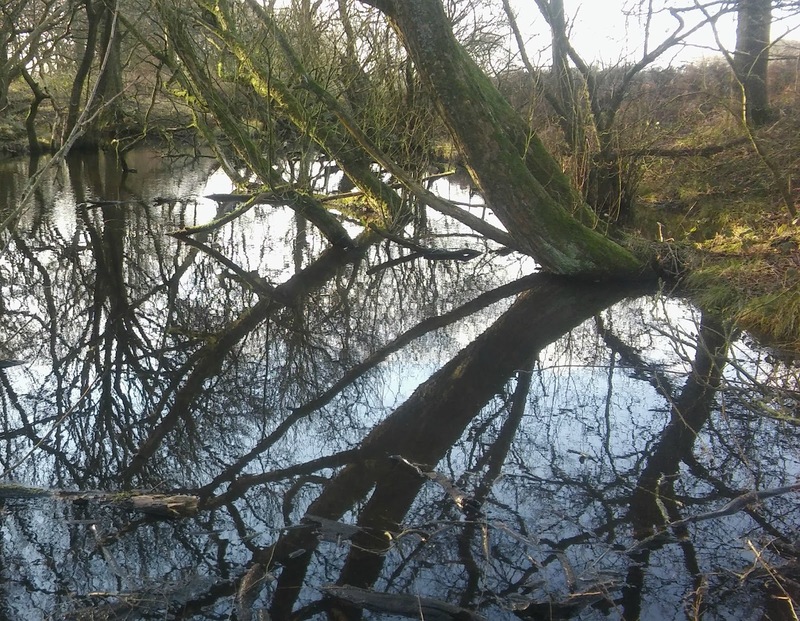 I'm not sure that they'd be ideal for an Arctic winter, but you'll know what sort of outdoor gear is best for your weather and if these would suit you. 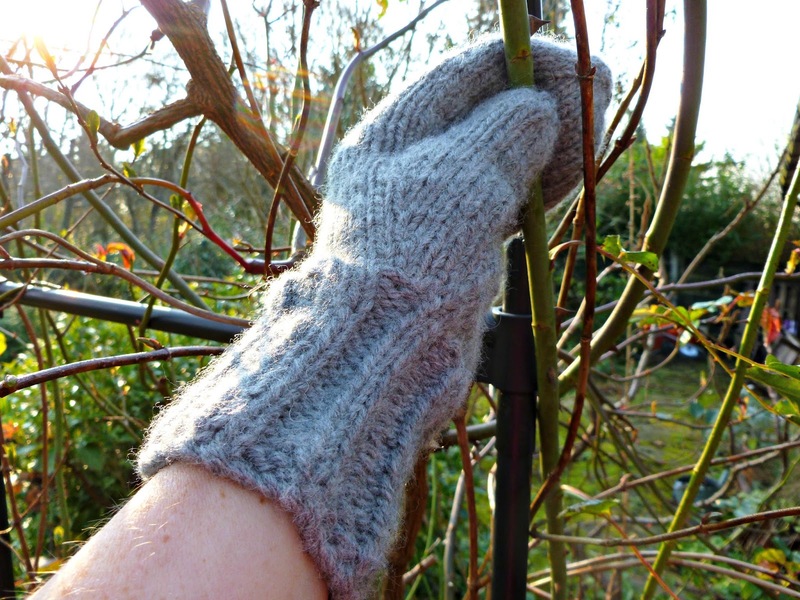 I am extra-ordinarily pleased with my mitts which work extremely well for what I need them to do, and just in case you would like a pair too, then read on! 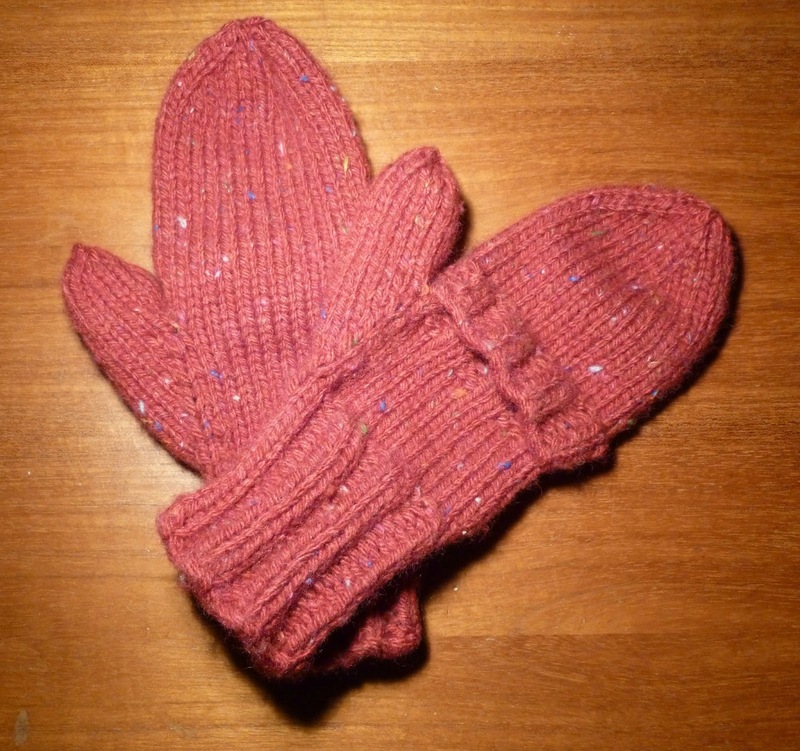 If you're going to be using the tutorials to help you knit these mittens, it's worth reading through all the instructions first! 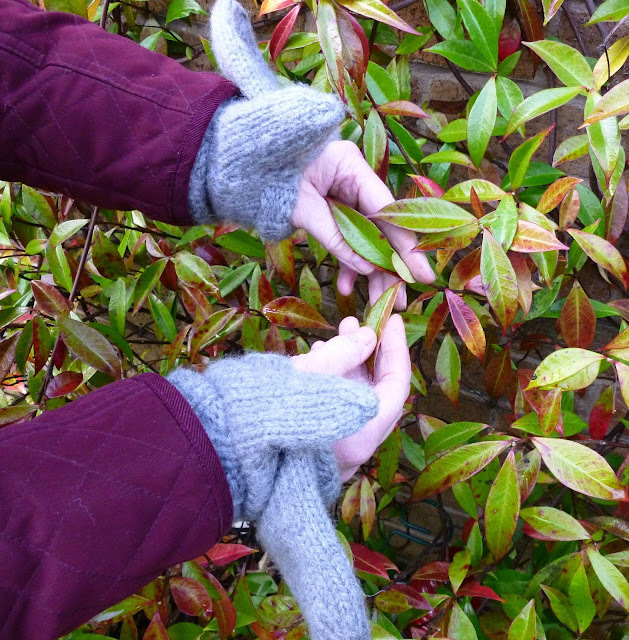 Split Mittens - you can find a PDF of the pattern here. Mittens with a useful split across the palm to help you slide your hand out easily when you need to use your fingers - without taking off your mitten! One size. As a guide, my hand is 19cm from base of palm to tip of third finger (but it's easy to change the length) and 8cm across the palm. 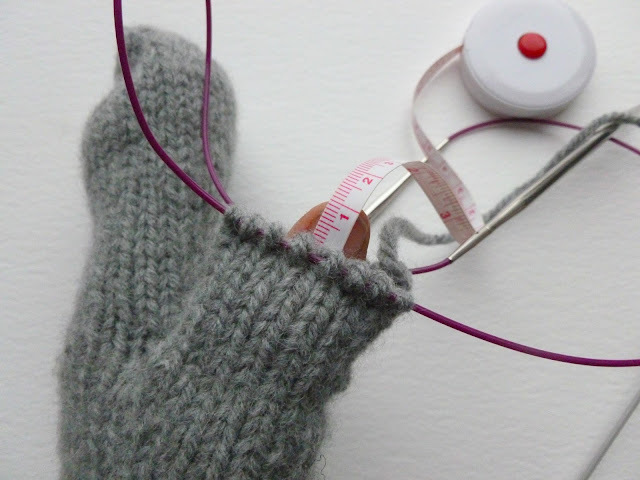 Want to make the mittens bigger or smaller? I haven't tested out other sizes as yet, but it should be easy to make a different size by adding or decreasing stitches in groups of 2 (so that your rib section still works). 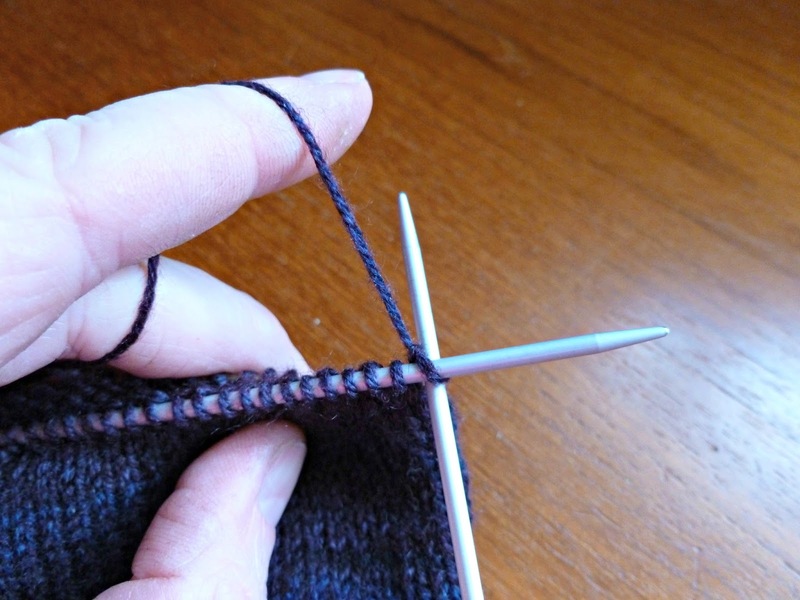 Remember that you may need to adjust the number of stitches in your thumb so that the rib split is across the middle of the palm, and it may also be necessary to cast on more or less stitches across the thumb gap. 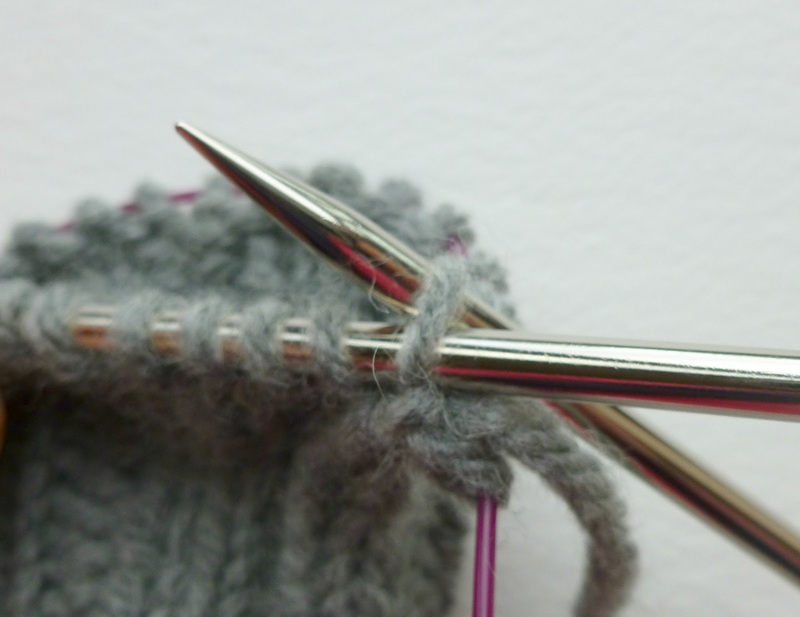 I have used smaller needles than suggested on the ball band to ensure a firm, warm fabric. 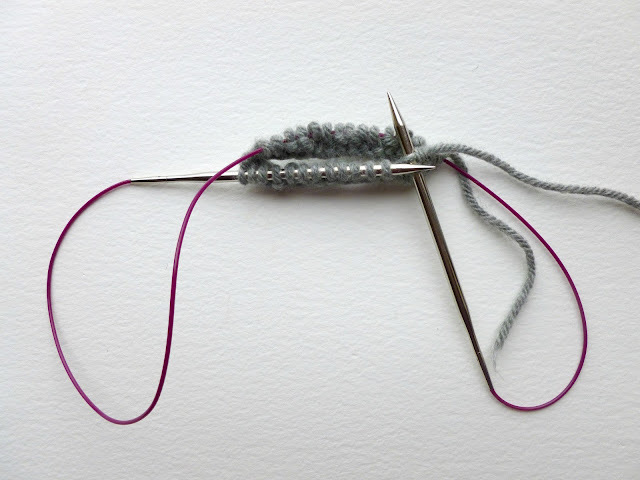 Because I am using magic loop, I have not used a stitch marker except where mentioned - because I have divided the stitches evenly across my needles then each side has been the "front" or the "back" of the mitten. If you want to put a marker on one side to remind you which side is which, then please do so. When you first put your hand through the flap of the mitten it will feel a bit tight, but it will loosen off with use so don't worry! Cast on 28 sts. 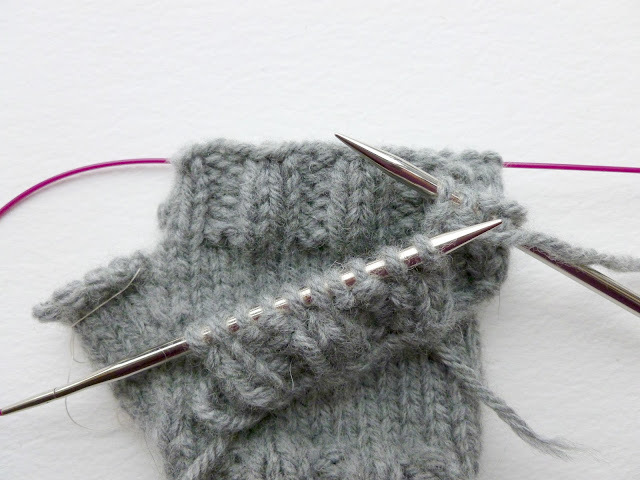 Make sure that you don't cast on too tightly so that it will be easy to get your mittens on - if necessary use a bigger needle size for the cast on. If you want to use DPNs, split the stitches across however many DPNs you wish to use at this point. Work one row in K2P2 rib. 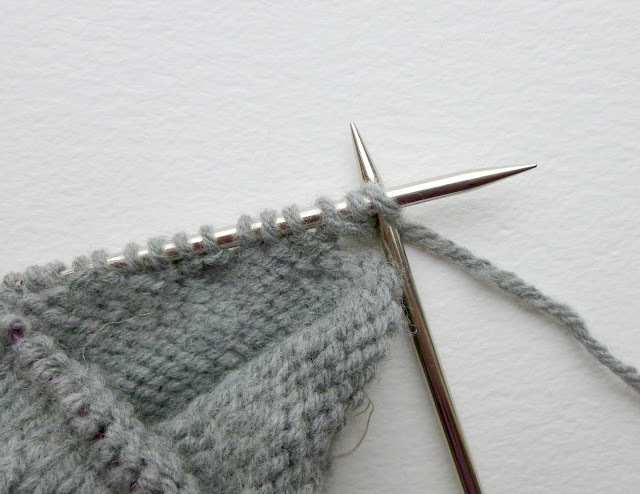 To join into the round, turn your knitting around so that the needle point faces the other way, count 14 stitches and push the cable between the 14th and 15th stitches to divide the total number of stitches evenly between the two needle tips. 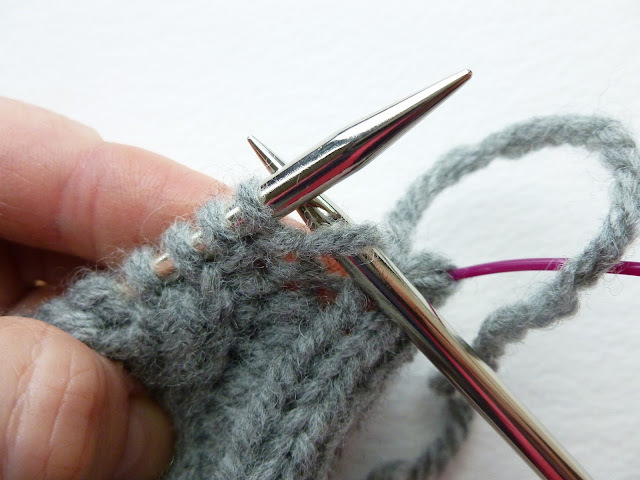 Push the front set of stitches onto the tip ready to knit them, and pull the cable through the back stitches to allow you to knit the front set of stitches. This joins the round. Continue in K2P2 rib until cuff measures 9cm (3 1/2") or desired length. 2 Insert your right hand needle into the bar. 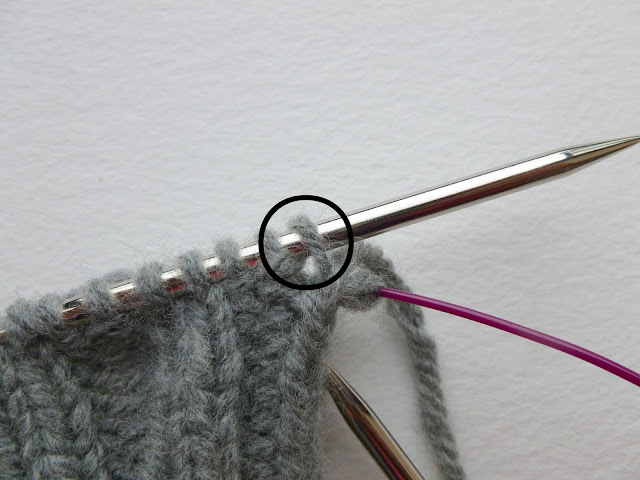 3 Now tuck your left hand needle underneath your right one to slide the bar onto your left hand needle to create a new stitch. 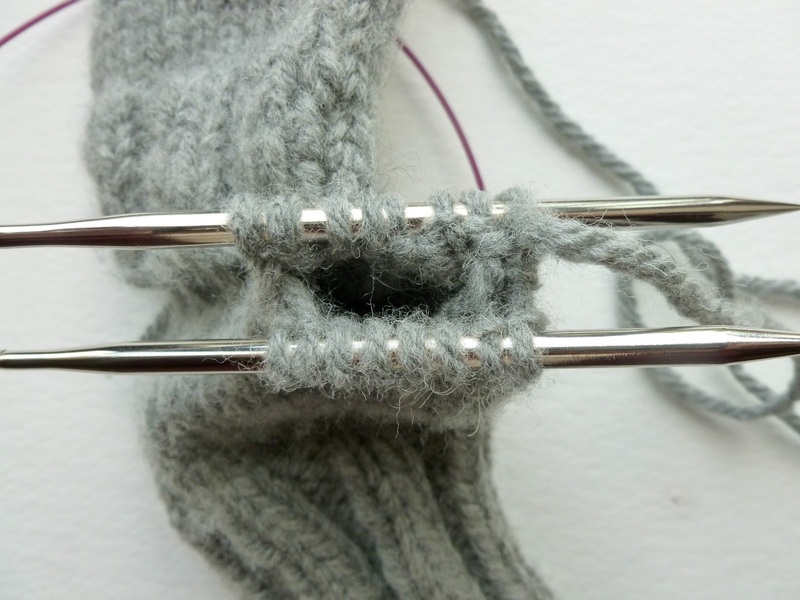 If you can do this without using the right needle to lift it up first, that's fine. 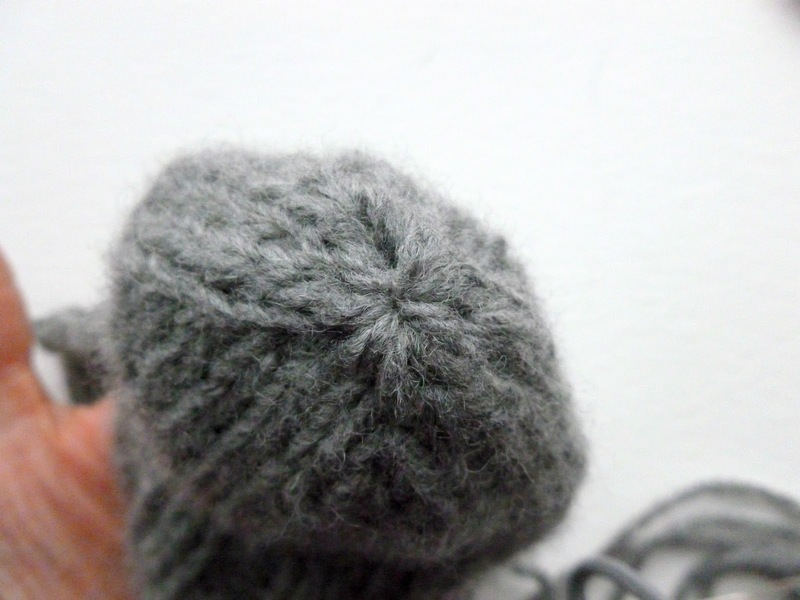 4 Now knit into the back of that new stitch so that it twists and that's how you avoid the hole. Your thumb section will look like this. As you can see, your thumb stitches are quite safe whilst your working stitches remain on the needles. 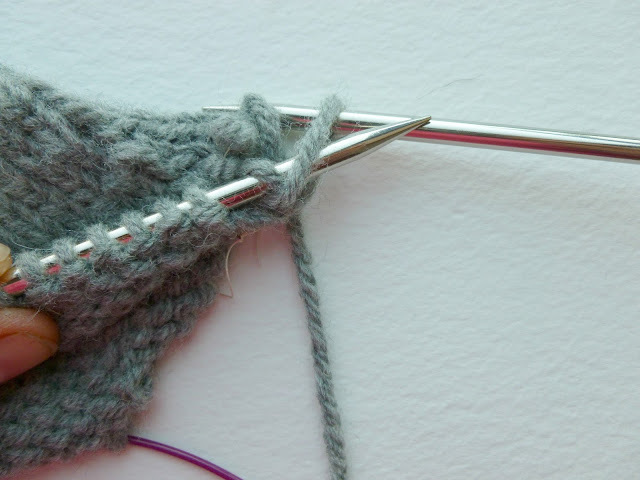 If you're right handed, cast on by putting your right hand needle into your left hand and casting on 2 stitches as you would cast on at the beginning of any project. If you're left handed, you may do it differently but as long as you end up with two extra stitches on that needle, it's fine. Round 2: K2P2 rib for 14 stitches, K16. Repeat this round three times (5 rows of rib). 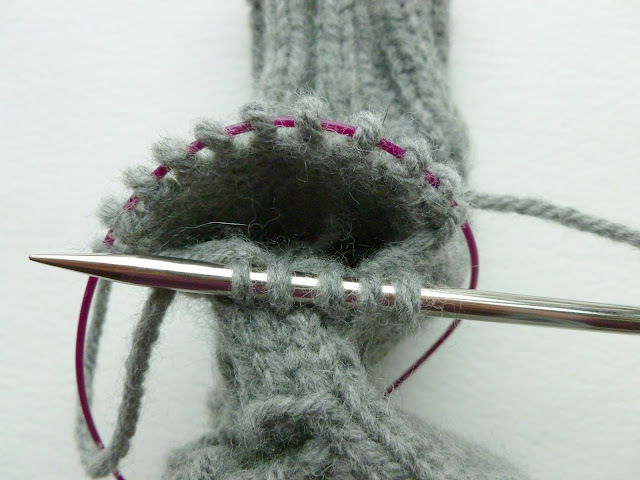 Note - If you want to make the length of the mitten shorter, work one less round of K2P2 rib across the lower flap. 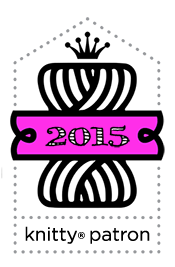 Loosely cast off 14 sts in rib, K15. 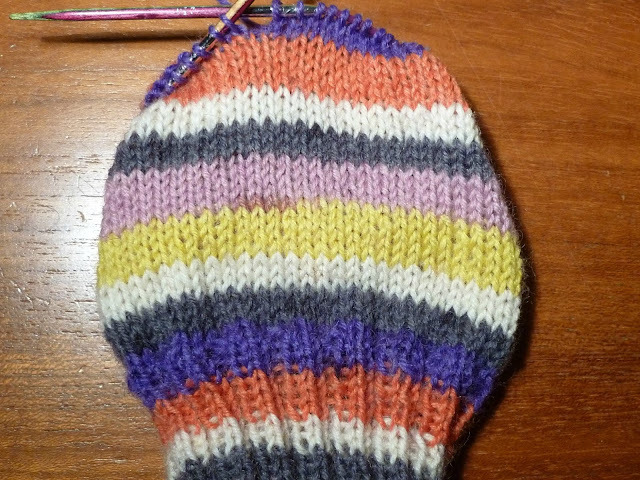 Your mitten will look like this. 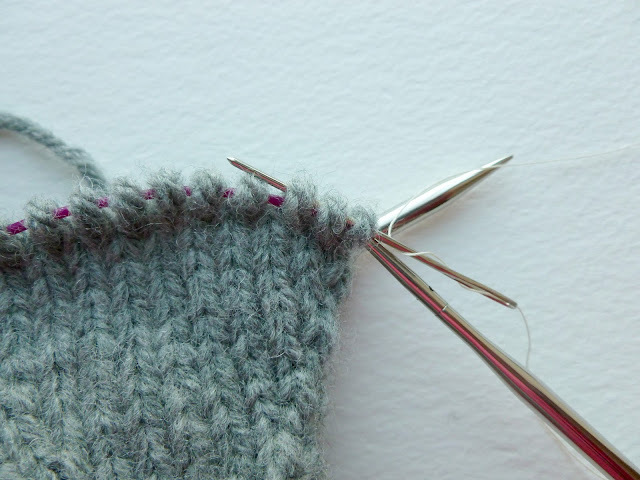 Slide the remaining 16 stitches down onto the cable to keep it safe as you are going to create the upper rib flap. Do not break yarn. Using yarn from the other end of the ball, cast on 14 stitches and K2P2 rib for 4 rows then break yarn. Note - I don't use a bigger needle for this cast on as I want it to be quite tight - if you make it too loose your flap will ... flap! Next, you are going to join this flap onto the mitten that you have already knitted. 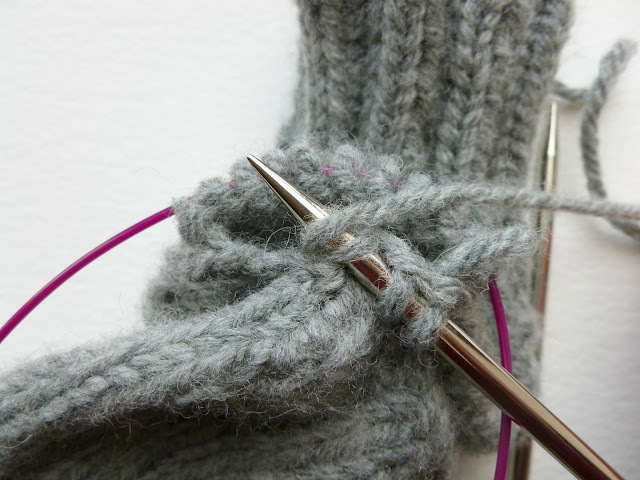 Using the original yarn which is still attached to the mitten on your needle, K2P2 across the new flap then K16 stitches. This will bring you back to the start of your round (your knitting should be in line with your yarn tail). K2P2 rib for 14 stitches, K16 for 2 rounds. 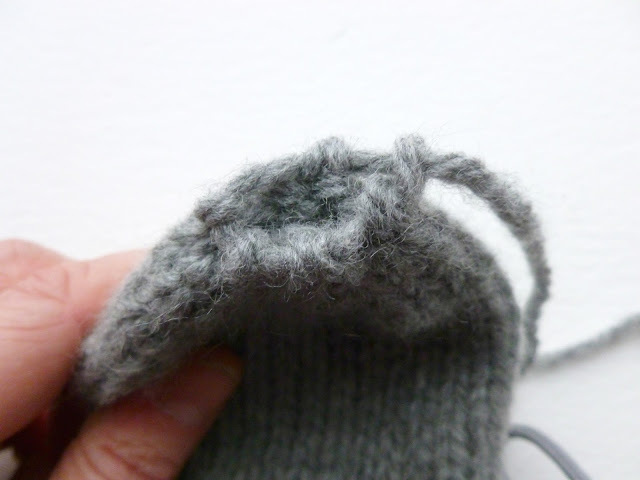 Don't worry if the join between the mitten and the new flap seems a little loose - you can always fix this when you come to sew your flap later. 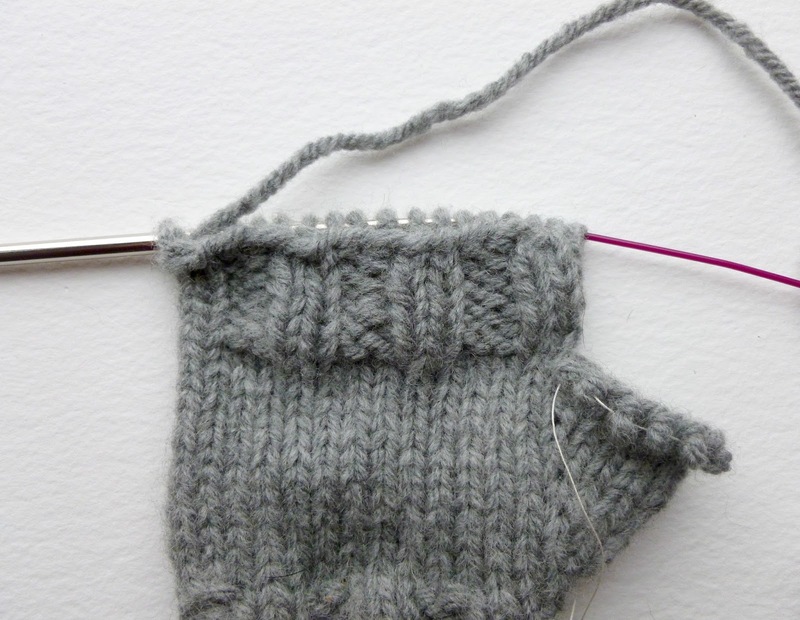 Continue knitting each round until your mitten measures 4cm (1 1/2") from desired length. 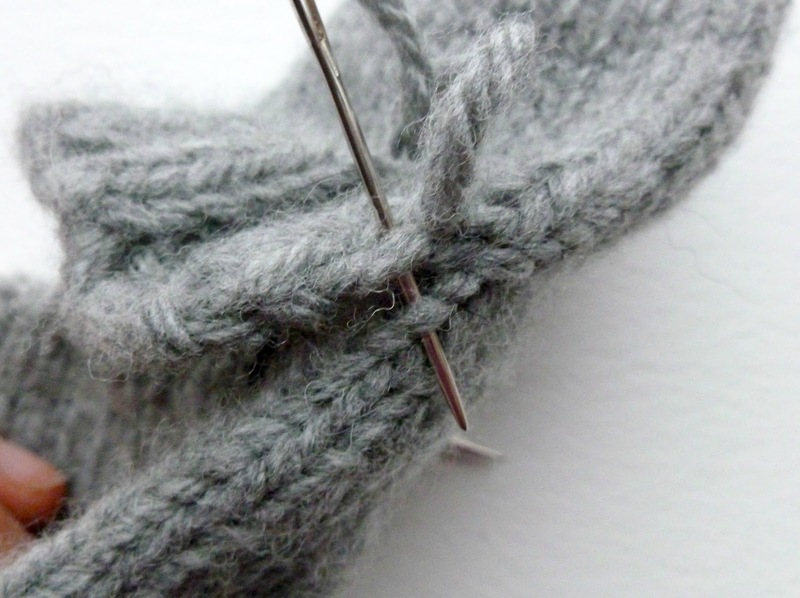 Cut yarn, thread through remaining stitches, pull tightly and weave in securely. 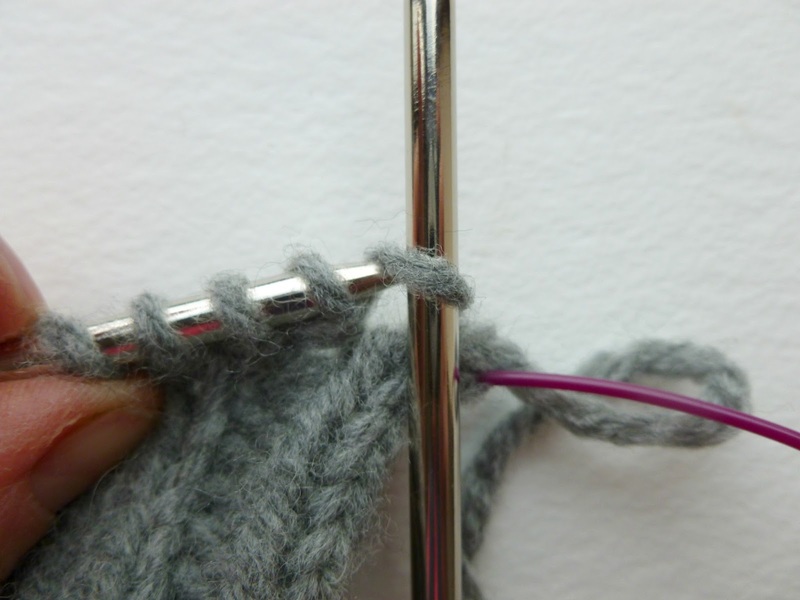 Put the stitches on the spare yarn or thread back onto your needle. 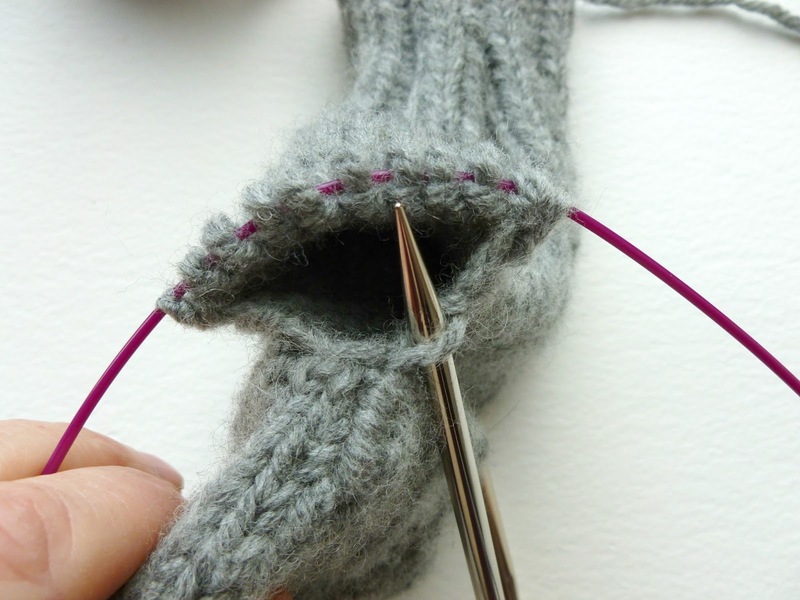 You are going to pick up 5 stitches from around the thumb hole to complete the thumb. You should find it quite easy to find the loops to pick up as you can see from this picture. 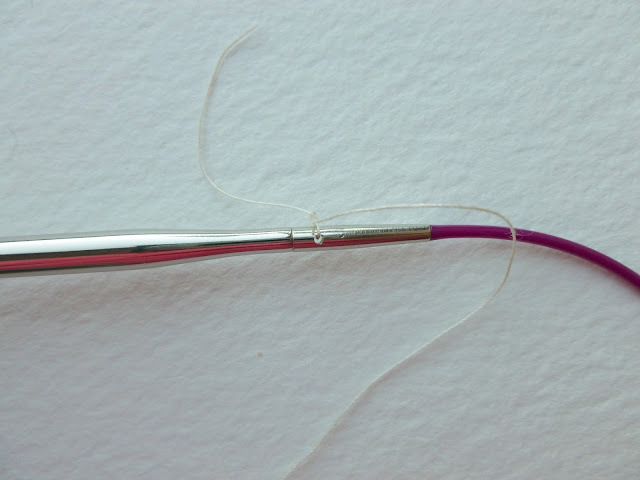 To pick up a stitch, simply put your needle into the loop where you want to pick up the stitch. and pull it through to create a new stitch. 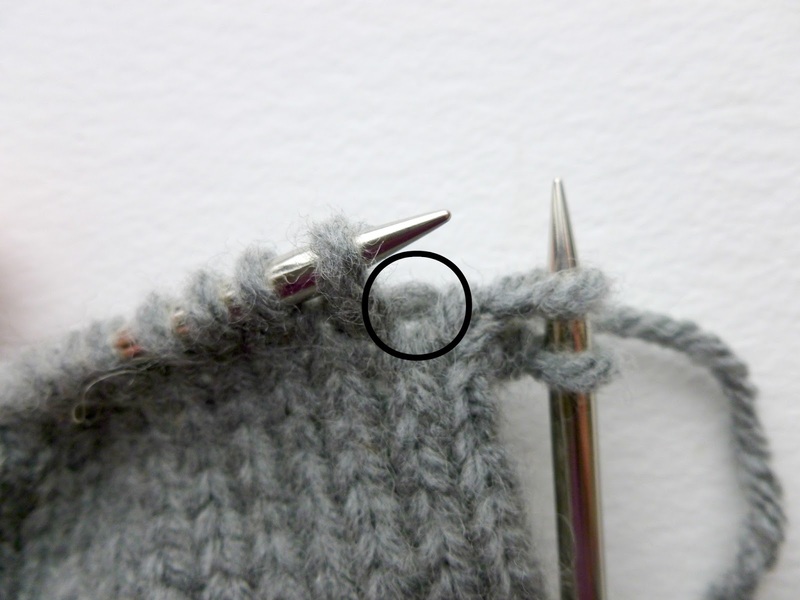 Now divide your stitches so that you have 8 stitches on each needle (16 sts). 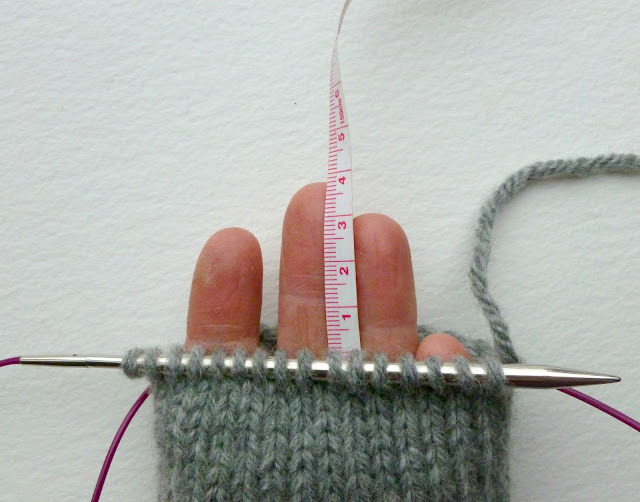 Continue to knit each stitch until thumb measures 1cm below the top of your thumb. 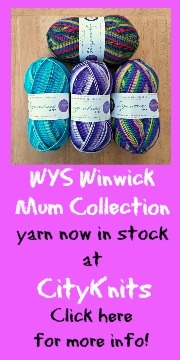 Break yarn and pull through remaining 4 sts. Pull tightly and weave in securely. Round 1 Knit 14, place thumb stitches on spare yarn, cast on 2 stitches onto right hand needle, K2P2 rib for 14 stitches to end of round. 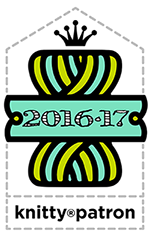 Round 2 K16, K2P2 rib for 14 stitches. Repeat this round three times (5 rows of rib). 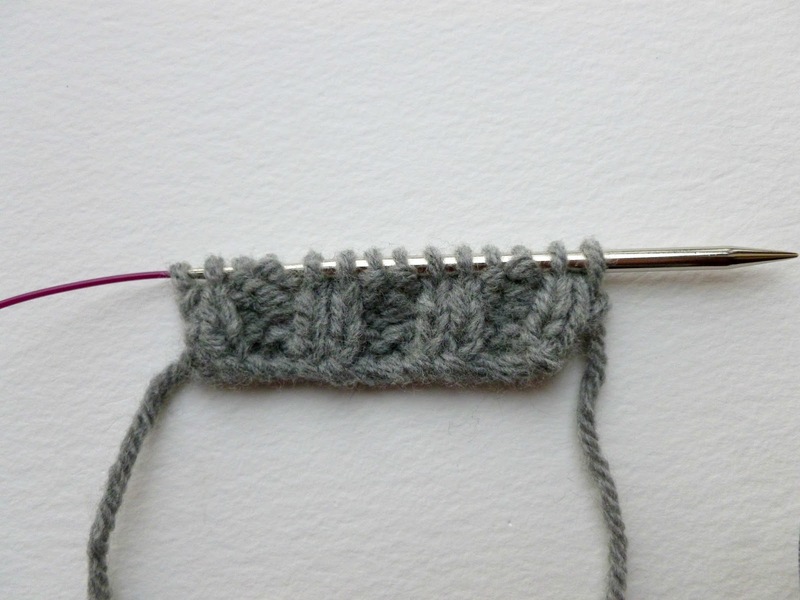 K16, loosely cast off 14 sts in rib (you will need to use one stitch from front needle to complete this). 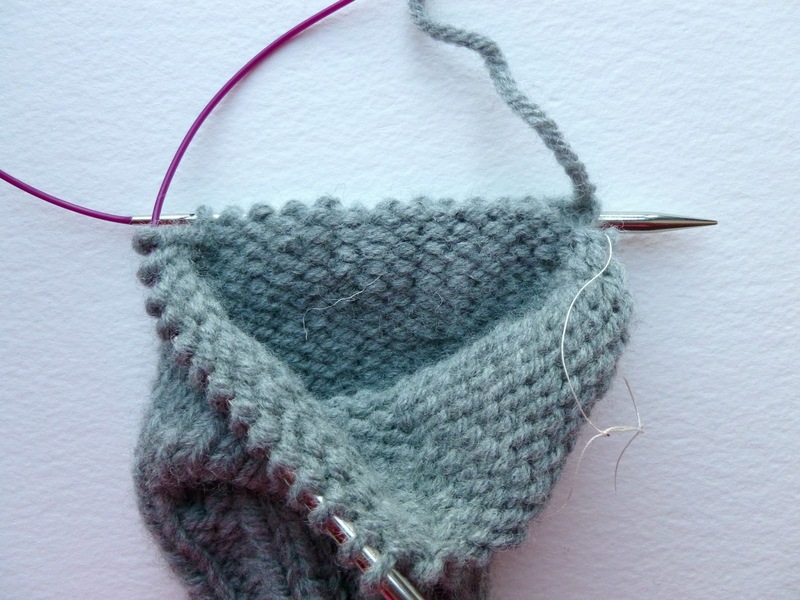 Knit across 16 stitches and slide the remaining 16 stitches down onto the cable to keep it safe as you are going to create the upper rib flap. Do not break yarn. Using yarn from the other end of the ball, cast on 14 stitches and K2P2 rib for 4 rows then break yarn as for left hand. 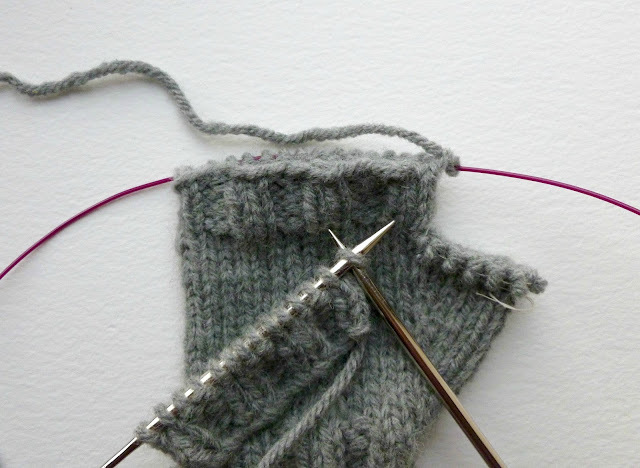 Next, you are going to join this flap onto the mitten that you have already knitted. Using the original yarn which is still attached to the mitten on your needle, K2P2 across the new flap then K16 stitches. 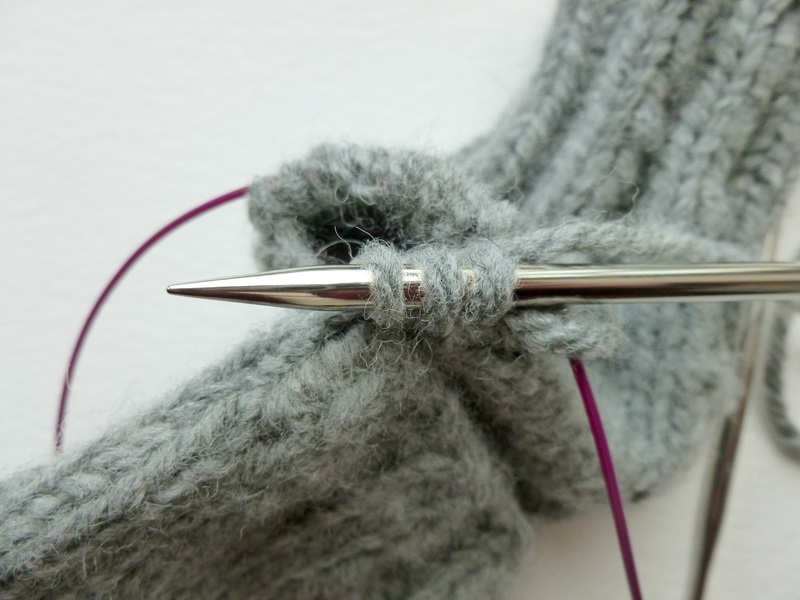 This will bring you back to the start of your round (your yarn should be the left above your thumb stitches). Work 2 rounds of K16, K2P2 rib for 14 stitches. Don't worry if the join between the mitten and the new flap seems a little loose - you can always fix this when you come to sew your flap later. Using the tail ends from the upper flap, sew both sides of the flap securely to the body of your mitten, matching the ribbed sections. Sew in the tail from your cast on and neaten any remaining ends. And there you have it. One pair of mittens which are far more versatile than other flap-less mittens but will still keep your hands nice and warm. Ta-dah! 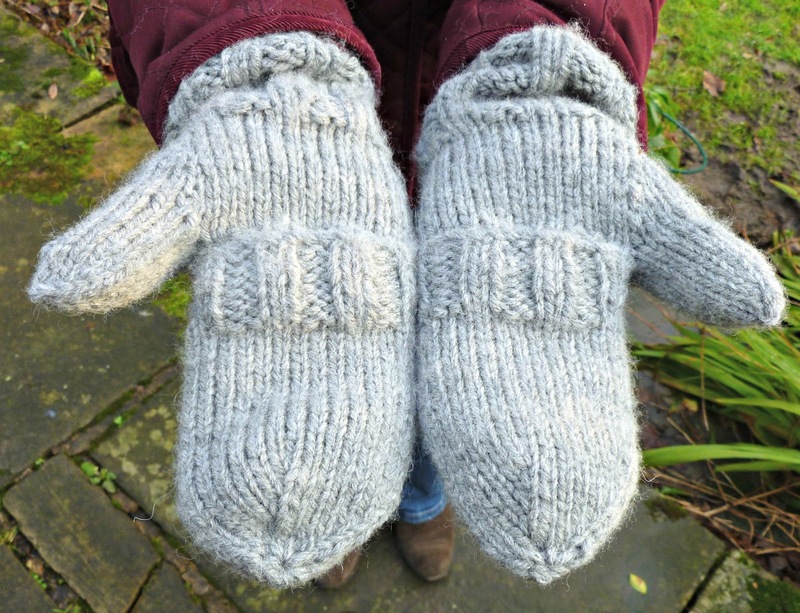 I'd love to see your mittens, so if you're on Ravelry please do link to the pattern and share your photos!